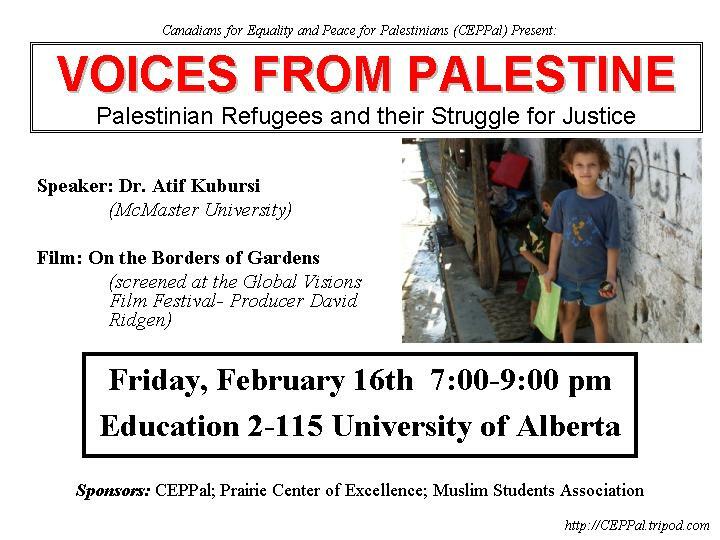 Dr. Kubursi is an Economics Professor at McMaster University and an expert in the struggle to develop a sustainable and just solution to the Israeli-Palestinian conflict. Dr. Kubursi was in Lebanon as recently as December 2000 and experienced the pain, confusion and hope for a brighter future brought about by the recent uprising. Screened during the Global Visions Film Festival this recent film brings to light the reality of the Palestinian refugee crisis today. An issue considered "too hot to handle" by many involved in negotiations, filmmaker David Ridgen tackles the refugee crisis head on with wit and nerve. Filmed on location in Israel and Lebanon, we view the controversy though the eyes citizens and refugees living on both sides of the border as well as former Prime Minister Shimon Peres and Palestinian spokesman Hanan Ashrawi. The film features appearances by Noam Chomsky and Norman Finkelstein. CEPPal is a grassroots organization working to build local and international networks among like-minded people and groups, which have as their aim the development of a culture of equality and peace in Palestine. This includes facilitating the exchange of information and views that contribute to the development of a regime in Palestine that respects the human rights and security of all peoples. We also aim to challenge all biased, dehumanizing and deceptive portrayals of Palestinians and/or their resistance in the media.